When London’s leading counterculture bookshop, Indica, closed in 1968, Paul McCartney and Barry Miles embarked on a project to create a “vinyl magazine” featuring recordings of poetry, fiction (and other writing) and music. The other Beatles supported the venture, and Miles was appointed manager of the new label, “Zapple”. With a wish-list of who to record (including Allen Ginsberg, Lawrence Ferlinghetti, Charles Bukowski and Charles Olson), Miles set off on a series of trips to the US, each time returning to base in his own small office within Apple Corps HQ, in Savile Row. The Zapple Diaries charts Miles’s experiences as he travels around the US, meeting and recording key figures from the literary and counterculture worlds of the late ’60s. Other albums planned for the label included John Lennon and Yoko Ono’s Unfinished Music No.2: Life with the Lions (released as Zapple 01), George Harrison’s moog album, Electronic Sound (released as Zapple 02) and a spoken-word album by Richard Brautigan, Listening to Richard Brautigan, which was recorded but never released on the Zapple label. Each time he returned to London, Miles found a changed mood in Savile Row, with disputes raging over whether or not to appoint Allen Klein as head of Apple. Once in charge, as Miles records, one of Klein’s first acts was to close the Zapple label, bringing to an abrupt end one of the most exciting and revolutionary experiments of the ’60s. 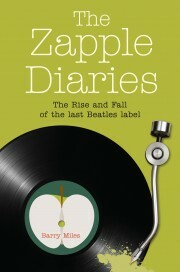 Illustrated with photographs and other images, and with its fast-paced text by Miles, The Zapple Diaries will be of interest not only to Beatles fans, but also to those fascinated by the ’60s counterculture scene . . . and its slow demise at the close of the decade.